Thanks to Donna @ Funky Junk Interiors for letting me steal this photo! 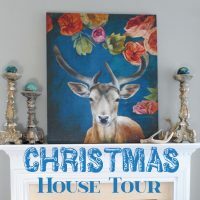 I’m so thrilled to be included in the Summer Tour of Homes, along with 24 amazing DIY Bloggers! Gina Luker did a fabulous job of putting this all together! 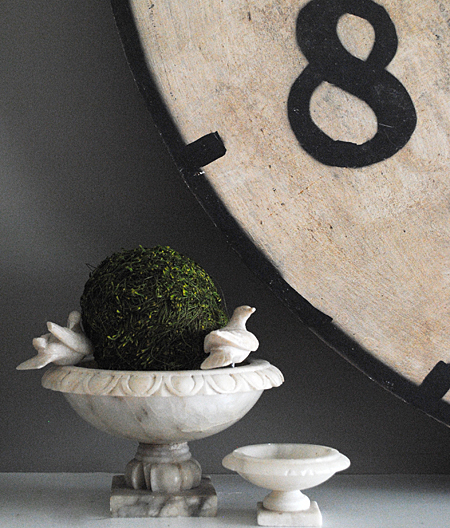 If you’ve arrived here via Brooke Ulrich’s lovely home, from All Things Thrifty then welcome! If not, make sure you go visit her now!! Let’s get started shall we? Come on in!! I went with Coastal Style Decor in the Living Room. I swapped out some bright pink pillows for these taupe Ikat Pillows found at TJ Maxx. Love that place! (We’re getting a Homegoods soon, I might be in big trouble then!) Anyway, our living room is more monochromatic now and I like the soothing tones for the Summer months.To see how our living room looked previously, go Here. 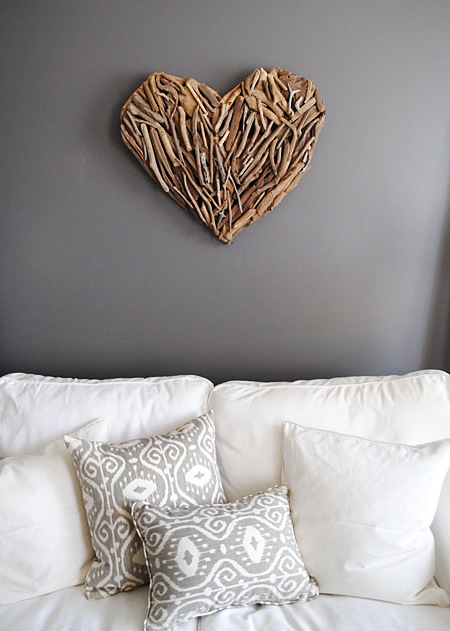 I replaced the Horse Art that was here with this great looking Driftwood Heart, also found at TJ Maxx. I love that it adds a bit of texture to this space. 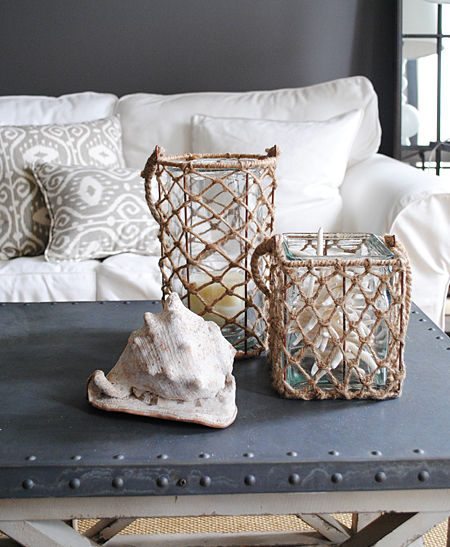 I placed a couple of rope lantern jars on the coffee table along with a vintage Seashell. 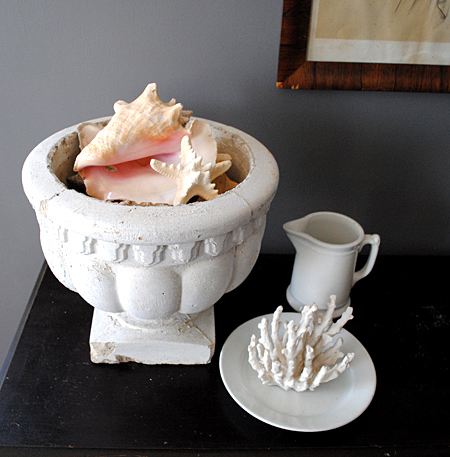 This concrete urn got a few Seashells as well, Pink Conch mostly and a Starfish. Here’s a tip, if you scour antique malls for these lovely shells, you can often find them much more cheaply than the new ones. Yard sales are a great place to look too! 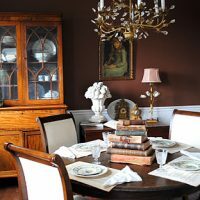 The chocolate brown walls in the Dining Room, don’t exactly scream out Summer. But I do love them anyway! I went with a Daisy theme in this room. 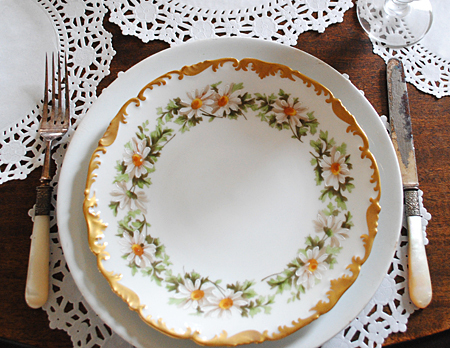 My grandmothers Limoges china was my inspiration for the theme. They have gorgeous hand painted Daisies on them, and gold along the edges. I put some potted Daisies, or actually I think they are technically Mums, in the center of the table. 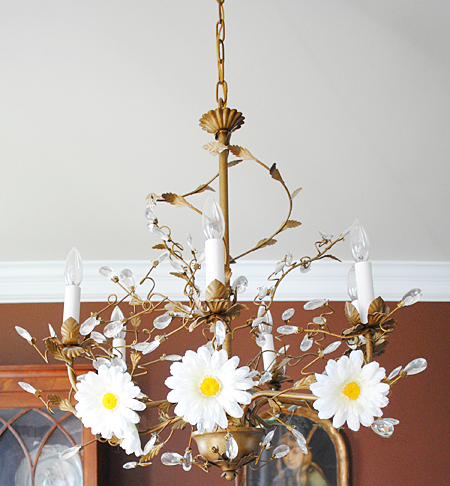 I even Daisied up my chandelier! That was my husband’s idea, if you don’t like it, blame him! I do think it’s cute though and Mr. Fairy is quite pleased with himself! 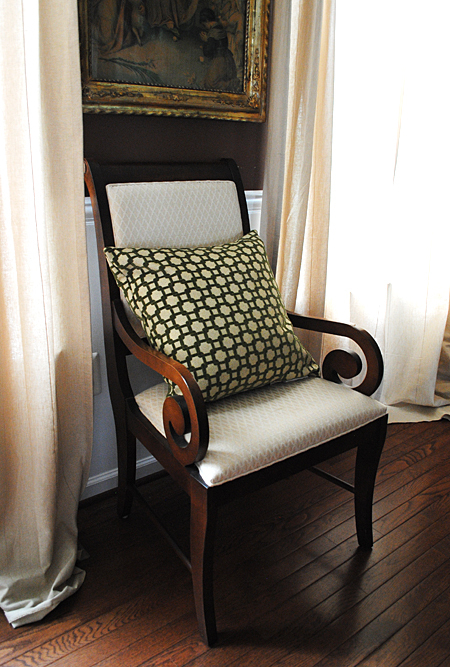 I added a little Geometric green and gold pillow to one of the armchairs. Now we are entering the family room. I didn’t change the Family Room a lot. I just added some greenery here and there. I did change out the candleholders on the mantel, these Frenchy gray ones are a bit more Summery looking than the chunky black ones that normally live there. I added a couple of Moss Balls to brighten things up too. I added some bright green linen pillows to the sofa, they have a jute edge, which gives them a little extra texture. It’s amazing how much a simple thing like changing out your pillows, can really change the look of a room! Previously I had a few antique books on this wicker basket, I swapped them out for these Succulents (no they are not real!) 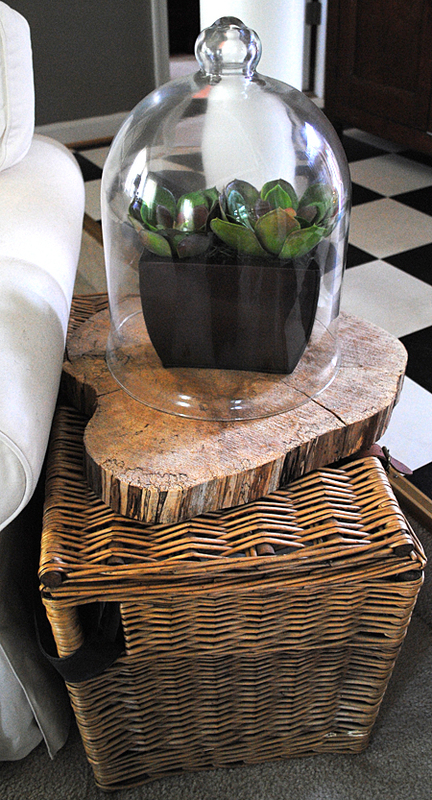 on top of a Tree Slice and topped them with a gigantic cloche that I picked up at a local Antiques mall last year. Here’s a little Zen vignette! 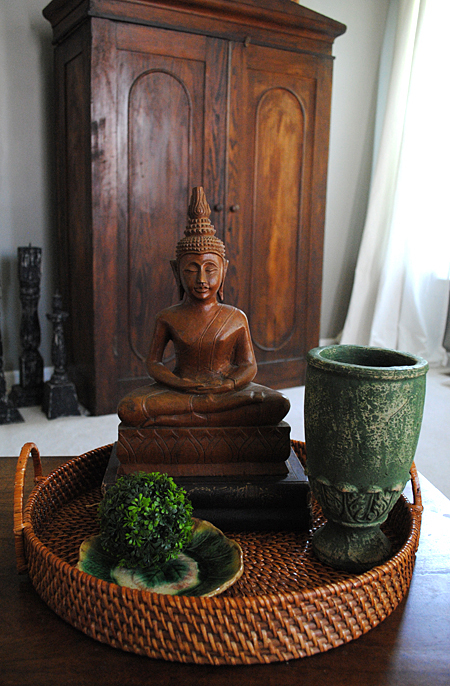 A Buddha statue that I picked up a yard sale for just a few dollars, a wicker tray, an Antique Majolica plate and some assorted green garden style accessories. 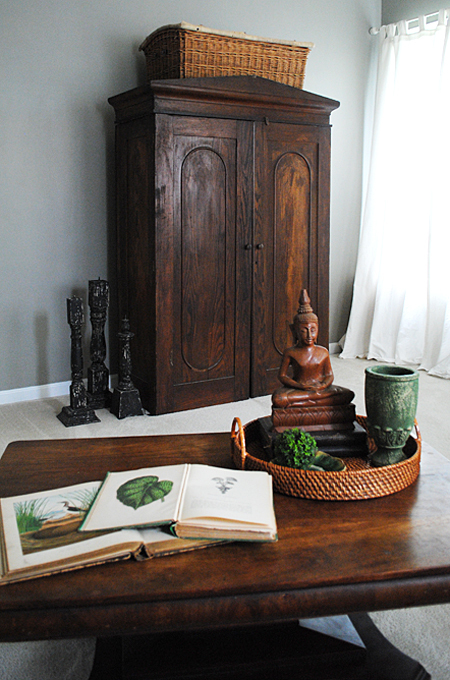 An eclectic mix for sure, I think it looks nice with our Antique Chestnut Wardrobe/TV Cabinet! 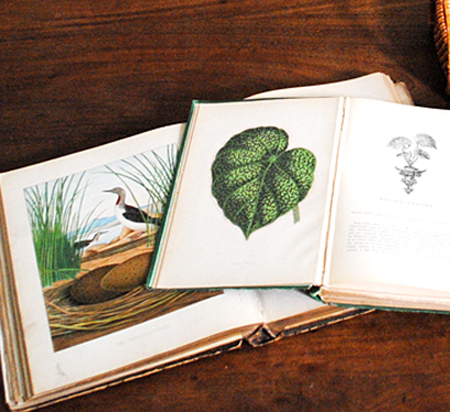 I added a few of my favorite Antique Books to the mix, both are Natural History books, one about Birds and one about Leaves. If these photos look familiar, I apologize, I cheated in the kitchen and used some old photos! I hope you enjoyed this tour of our home! 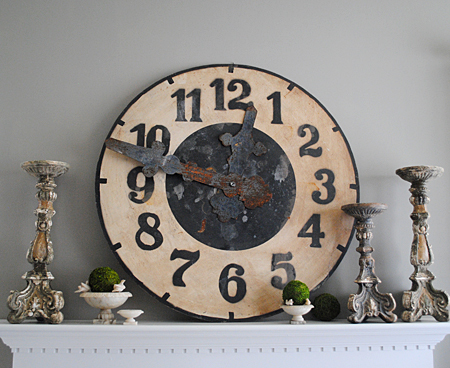 Be sure and stop by the next fabulous home on the Tour, and visit Emily from Decor Chick ! And here’s the rest of the schedule for the whole week, you won’t want to miss a single home. Thanks so much for visiting me today! 5 – Karen @ The Graphics Fairy …You’re here! Day 5 (June 7th) Linky party at The Shabby Creek Cottage! wow!! what a great home you have!! Thank you for letting us into your house! !I love those lantarn jars!! Thanks so much for your sweet comment, I’m so glad you liked it! Hi Wendy, Yes, the color is SW Gauntlet Gray and that’s the only paint color that I used in that room. 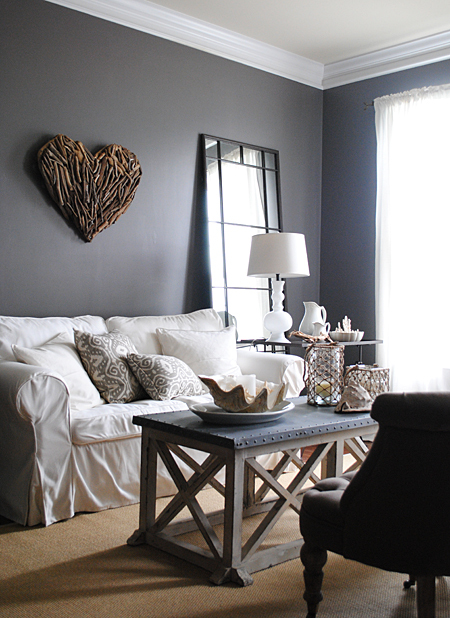 If you have gray in your sofa, you could certainly pull that color out and use it on your walls. The pillows sound beautiful, but perhaps might be too much pattern, since your sofa already is patterned. I would probably try to do pillows that are more neutral on the sofa. Maybe you could use the Ikat pillows somewhere else in the room, like on some neutral chairs. Thanks for your kind words about my living room!! Karen your house is gorgeous… I love all the wood! 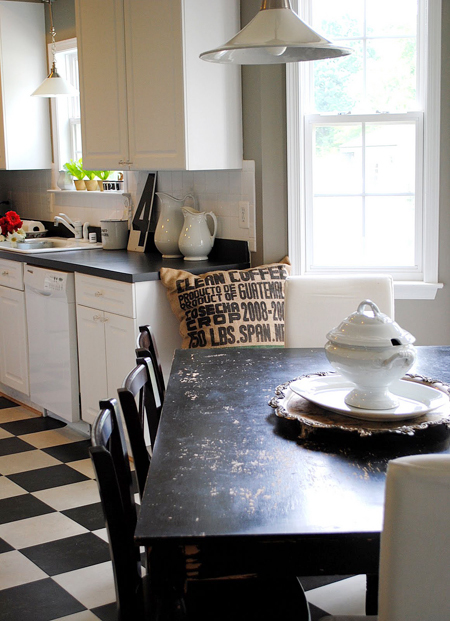 I’ve also got my eye on that black and white floor… I’m looking to make a floor mat with black and white checks for my kitchen…. great inspiration! Thank you Susan!! Your floor mat idea, sounds like a fun project, I’m glad you were inspired! Karen you have a lovely home! 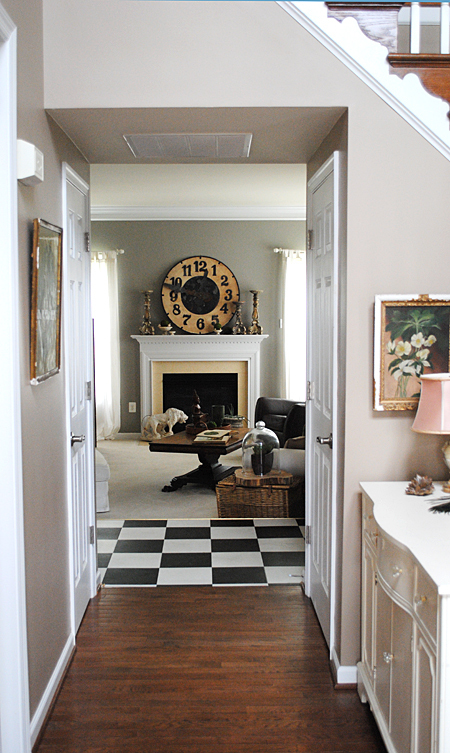 I love the neutral colors but with accents of color here and there and your use of texture is amazing! Thank you Bonnie! That’s so nice! Karen your home is so gorgeous! Can I move in? Kidding… kinda…. You are so welcome Kerrie, thanks for your kind comment! Beautiful home! It is just as inspiring as your blog. I love your style. Thanks so much for sharing with us! Ohhh…. I’m so in LOVE with your home. Even with changes, it’s just amazing! Every square inch! Your photos are rockin’ it, girl! I don’t think I’ve ever come across a more photogenic home… ever. Aw, thanks Donna!! Thanks so much for your photo tips too, it was fun shooting it in manual for once! I couldn’t have done that with out you!! love your house tour. i love all the textures and patterns; it all looks very inviting! Wow wow wow!! Just gorgeous Karen!! Thanks Emily!! I’ll be popping over to your blog shortly, I was gone all day, but can’t wait to see your home and all the others that I missed! I am in the process of moving from my first ever home which i have lived in for 24 years, it has felt overwhelming and sad at times. However your beautiful home has made me excited about the prospect of decorating and dressing my new home, searching out pieces for it. Thank you so much for sharing your home with me, and helping to turn what has been a stressful time, into what feels like it could be a nice adventure. Thank you again. I am in the process of moving from my first ever home which i have lived in for 24 years, it has felt overwhelming and sad at times. However your truly beautiful home and the calmness and warmth that seems to surround it, has made me excited about the prospect of decorating and dressing my new home, searching out pieces for it. Thank you so much for sharing your home with me, and helping to turn what has been a stressful time, into what feels like it could be a nice adventure. Thank you again. Wow, what a fabulous compliment, thank you so much! I’m so glad you are feeling inspired! It will be a new beginning for you, whenever I move, it always gets the creative juices flowing, I hope it will be the same for you! Wow your whole house is beautiful but your living room is stunning! Absolutely love your style! 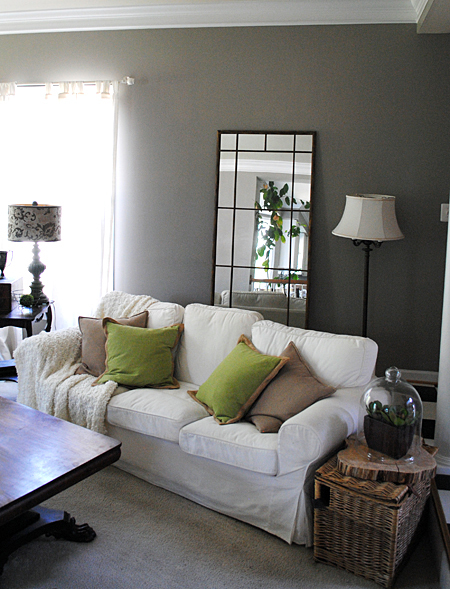 i just love your living room- the saturated gray is beautiful! Thanks Cassie! It is a calm soothing color, I’m really enjoying it, since I painted it last year. So lovely! I enjoyed all of the natural elements-makes it so peaceful.. Thanks! Thank you, I’m so glad you stopped by to visit my tour! I love the casual but sophisticated feel of your home. It looks so comfy, but you have so many interesting details to delight the eye. Love the blend of textures, and the flower theme is really sweet and sentimental, yes, even the chandelier. And somehow the heart really grabs me. I was expecting it to be handmade by you or an “artisan.” A little surprised it’s TJ Maxx, but hats off to you for making it part of such an elegant home decor. I’m already thinking, how can I make that myself? Aw, thanks! I did buy some supplies to make a few things, but the deadline snuck up on me and there was no time! It would be easy to make that heart, I think a big star would be cute too! Wow! Thanks Lisa, that’s so nice!! I can’t wait to see your home too!! Love your beachy touches and your home looks amazing! I always find shells and coral at estate sales and scoop them up! 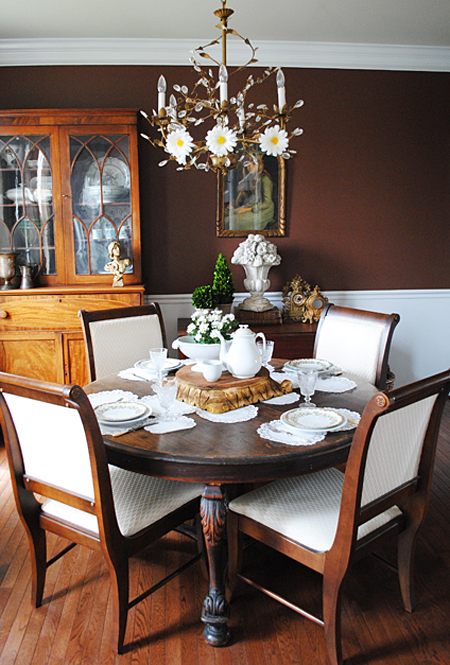 Your grandmother’s china is beautiful – love how you tied in the chandelier with it. Thank you Kelly! The coral is getting harder and harder to find, I can’t remember the last time I even saw any, I ended up using resin coral for my displays. Your home is lovely. I was wondering where you got the rope lantern jars. So pretty! Hi Marilyn, I got them at TJ Maxx as well, I’m guessing that you might be able to find them at Homegoods too. Go soon though, they were a steal at $9.99 a piece, and will probably go quickly! 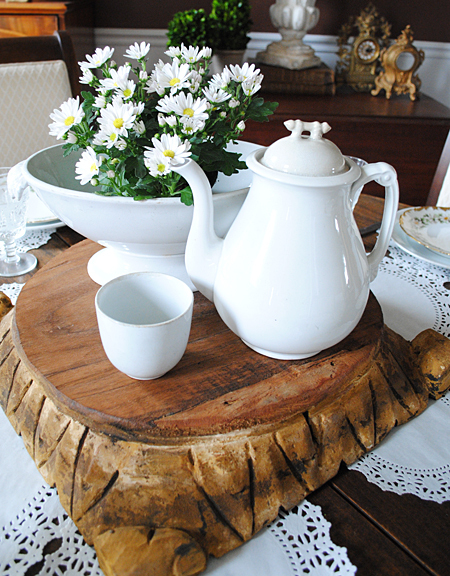 Wow, your home is so soothing and welcoming, and I am absolutely drooling over that daisy china. I am off to look for it on ebay – LOL. thanks for sharing your lovely home! Thanks Sue! I hope you find them, they really are beautiful! Karen! Your home is so gorgeous. 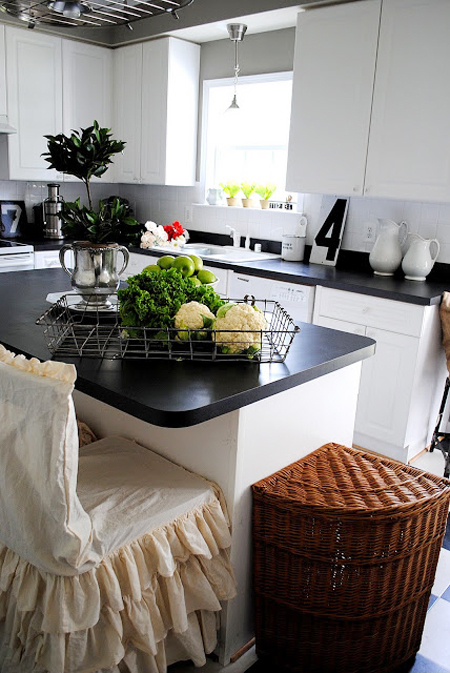 I love the coastal beachy feeling and your kitchen with the slipcovered barstools is amazing. Love it!! Thank you so much Jen!! I'm so glad you stopped by sweet friend!! Hi Leena!! I'm glad you liked it! Enjoy the tour, there are so many amazing homes to see!! WOW, I adore your home! That grey in your living room, I must know what that colour is? <3 You have perfectly created focal points and colours that pop, just the right amount of colour and texture contrast everywhere, the balance is dead on! Amazing! Hi Laurie, Thank you so much! The Gray paint is by Sherwin Williams it's called Gauntlet Gray. I think you will love it if you try it in your home, it really is a nice color to live with! I love your home Karen, you can see your personality shine right through!!! It looks like a comfortable peaceful place to live, and that is what a home should be! It is very pretty and I LOVE your gray walls! Thanks for the tour!! Your home is gorgeous Karen! Love both your dark walls. The gray and the chocolate…so pretty! You have a very nice home. I like the colour of your dining room – very warm and inviting. Thanks for the tour Karen! Thanks for your sweet comment Marie, I'm glad you liked it! LOVE your home! You have some amazing pieces. We have the same dining room chairs… I love seeing what you did with them! so pretty. Thanks Ashley! Yes, I noticed that about the chairs too, how funny!! I left you a comment on your beautiful tour, it's most likely in your spam folder, I'm having comment issues. Thanks for stopping by! Aw!! Thanks Stacy! I can't wait to pop over and visit yours!! Love your site.. Had to know your home would be perfectly wonderful too! Thank you Stacy! That's so nice!! I love it all, Karen! It’s all so comfy and relaxing! I need to come visit one day when I’m on a road trip! Thanks for sharing you lovely home! 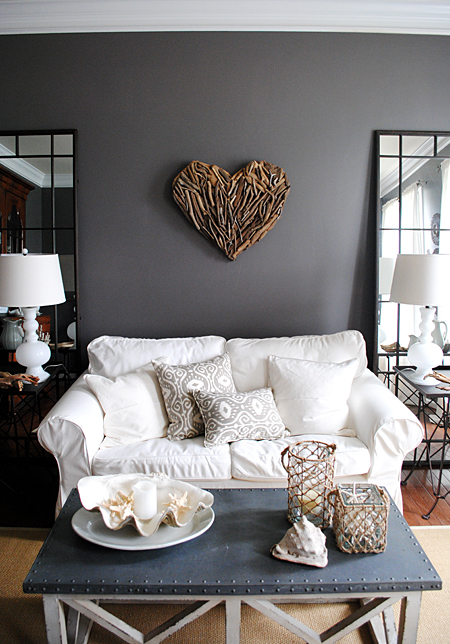 That driftwood heart is fabulous! On your mantel, it appears you have a set of three marble bowls. The largest is featured in the photo with the clock behind it. I have THAT SAME BOWL! And, I never knew it used to have birds on it! I usually put potpourri, pine cones, or even a pillar candle in mine. Thank you SO much for that photo. Yes, I collect those marble pieces, I have quite a few of them! They were souvenirs from Italy, tiny marble bird baths. Sometimes the little birds did get lost. I have a couple that are missing them too. I’m so glad your mystery is solved for you! Enjoy your treasure, I think they are such charming pieces! Thanks for the fonts,i Love all! Where I found text GRAND PRIX PARIS exposition universelle? Absolutely gorgeous! WOW! You rock that dark gray wall too and I love all of the natural elements you use such as wood and seashells. GORGEOUS!!! Everything looks great. Although it might seem simplistic a lot of thought goes into making rooms look like that. Great Job!